Below is a picture of my son, Norrin. He will be seven years old tomorrow. He has autism and goes to a special education school in Westchester - 22 miles away from our apartment building in The Bronx. As my husband and I are both working parents - we rely on the Office of Pupil Transportation and the Local 1181 to get Norrin to and from school safely. I am sure some wonder why we would choose to send our only child to a school so far way. It was not an easy decision to make. But not a single public school in The Bronx could meet Norrin's specific needs. It was a fight to get him placed into a specialized school but his school was well worth the fight. 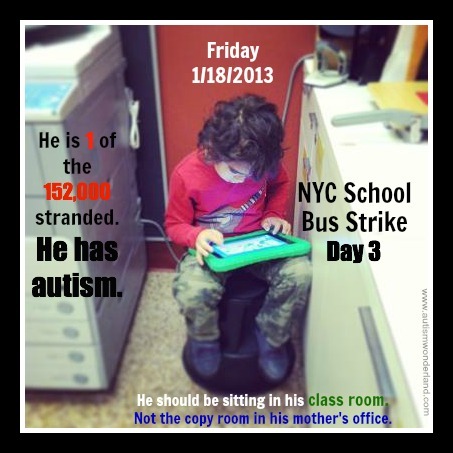 Yesterday, Friday, January 18, 2013, was the 3rd day of the NYC School Bus Strike. And my son Norrin is 1 of the 152,000 students stranded. On Wednesday and Thursday, I had no choice but to take vacation days from work to stay home with Norrin. But on the third day, I had to go into work. And with limited childcare options, I had no choice but to bring Norrin in with me. I am administrative assistant and my husband is a NYS Supreme Court Officer - we don't have the kind of jobs where we have the privilege of working from home on a whim. My husband, cannot even manage to take a single day off from work to pick Norrin up from school. So the responsibility rests on me. And while we have a car, I do not know how to drive. In order for me to get Norrin from school, I need to take a bus, MetroNorth and a cab - it's a 2 hour commute (one way). And I know parents are to be reimbursed for service but it's a $75 fare and I can't afford this on a daily basis. Norrin isn't the kind of kid who can ride in a car pool with strangers. He still sits in a car seat. He has limited language and functions at a 4 year old level. Norrin's a runner and needs his hand to be held at all times. And while Norrin is okay riding trains - I do not feel comfortable sending him off with someone else - whether they know Norrin or not. When I commute with him, I keep both hands on Norrin while waiting on train platforms and when sitting on the train, I keep a hand on his knee because he tries to get up. If we're standing, I have to keep reminding him to hold on because he doesn't know how to keep his balance. So now I am forced to choose. Do I go to work? Or do I take my child to school? I heard that out of the 145 students that attend Norrin's school only 43 kids showed up. These kids are missing out their much needed related services like Speech and Occupational Therapy. And because school is technically open - these services will not be made up. They are missing out on classroom instruction and peer relationship building. Their routines are being disrupted. These are children at risk for regression. Norrin has come such a long way since his diagnosis, I cannot risk him regressing. And after disruptions to his routine, it takes weeks to get him back on track. So on Tuesday, I will need to take another vacation day so that Norrin can go to school. I have a generous amount of vacation time - four weeks. But if this strike goes beyond my vacation, I have no idea what I will do. I've already spoken to the Human Resources department and I've been told that this doesn't qualify for FMLA. And I need my vacation time to Norrin to appointments, for IEP meetings, for evaluations. This is beyond a stressful situation. So it seems ironic to me that Local 1181 members are fighting for their job protection, while so many parents - especially parents of special needs children - are worried about their own job security. My job is not secure - I can be let go at any given time. And while my bosses may be understanding, my being out of the office is an inconvenience. I worry about my job. Because I need it. And I have no union to fight for my protection. This strike must end soon. Because the individuals who really need protection are our kids. And I am fighting for them. 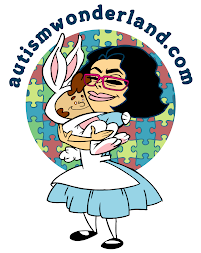 MAKE YOUR VOICE HEARD - please sign the petition started by Miz Kp of Sailing Autistic Seas! This is ridiculous. You say that Norrin cannot have changes in his life, what do you think will happen if we let the mayor bid out our drivers' jobs? BIG CHANGES. How would you feel if God forbid Norrin gets on a bus driven by unqualified, underpaid drivers without proper training. They can walk in drunk or on drugs and do not get tested. They will not be trained in cpr or take classes on what to do in an emergency with special ed children. I wonder if you would still be whining about your inconvenience if your son's life was at risk everyday he rode a school bus. Oh and as for your husband, ask him how he would feel if he worked for 40 years and retired without a pension. You say you are fighting for the kids, but you.dont appreciate all of the wonderful caring drivers who take him to and from school, so that you dont have to. Wake up. That's right tell it like it is the mayor thinks his the allmighty and we all should vow to him this mayor should take a one way trip to hell because that's where his going to end up anyway. As a parent who has a serverly disable daugther I get where you are coming from. I've miss out on a lot of work and use almost all my sick days plus one week vacation. Since the strike she has only been to school twice. It's very had to get a wheelchair into a taxi. When I saw that the mayor turn down the offer the union put out this week I believe I saw red. Mayor Bloomberg have a heart for the all the kids that need school to get there services.